Inflatable Sport Catamaran Boat MC330. All New 11' Sporty Inflatable Catamaran MC330 V2.0. New V2.0 sport design comes in red with yellow accent, grab handles, safety rope on top of tubes, and pointed end-cones. MC330 inflatable catamaran is a versatile watercraft that is great as a tender for main ship, stable fishing boat or just a weekend pleasure cruiser. MC330 is very stable boat and run nice and easy even with an inexpensive trolling electric motor. Mini Cats are designed to be inexpensive budget solution watercraft that can go nice and easy with small gas outboard or affordable electric trolling motors. However, care has to be taken when going fast against the strong winds, as it may flip boat over if operated improperly with wrong weight distribution. As with any other watercrafts, always wear life jacket and use outboard lanyard kill switch when going fast. Large diameter tubes provided great performance and stability. Lowered front bow allow easy getting from the water and back into the boat after pleasure swim. Splash plate on a back of the transom minimize splashes from high powered outboard motor. Directional fins on bottom of tubes help with directional stability and tracking. Easy planning even with a small electric motor. 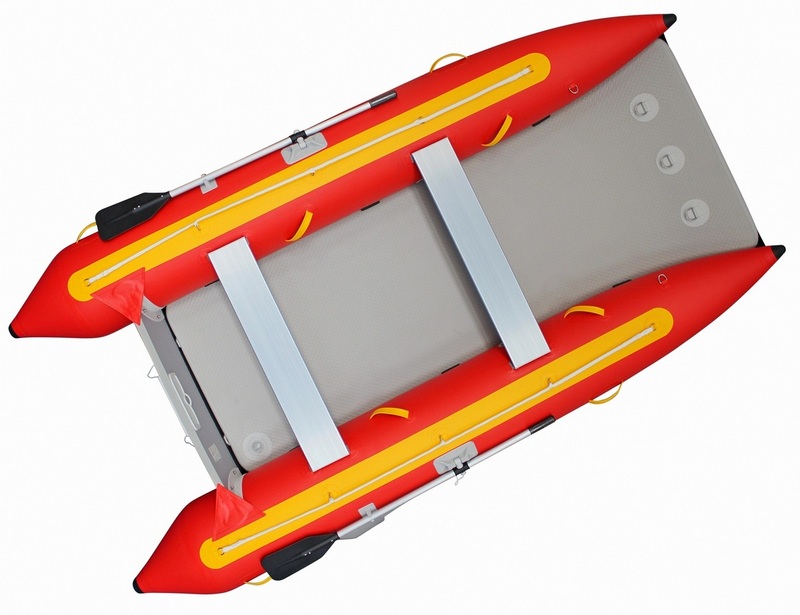 High-pressure drop-stitch inflatable air deck floor. Two air chambers per tube for better safety. Excess air pressure release safety valves on each tube. Included: hand pump, repair kit, set of oars, 2 aluminum benches and carry bag. 52 x 28 x 12"
The 11' catamaran is a great boat. It would be great if it also came in gray for those hot summer days. Other than that it is a reliable boat that doesn't need much to get it moving. I put the recommended 10hp on it and it's more than enough. A trolling motor will even be fine. This was my first inflatable. I decided to go with the MC330 catamaran because of the advertised "Quick and easy set-up". I was extremely easy to inflate with the electric pump! Took me about 10-15 minutes to put everything together and have it in the water. I don't have a trailer so I needed a boat that I could inflate and deflate to put in my car. Great boat, i recommend it to anyone who wants it for the same reason I bought it. It's gone really well. Happy with it. I've tricked it out a little with 4 rod holders, the wheels and then a 2 hp Honda 4 stroke, portable hummingbird fish finder (not on the pics yet) and, I now have some pics of my minicat 330 in use to share.